There are no shortage of surveys and studies that have found consumers aren’t doing so great with their finances: from 45% of Americans carrying at least $25,000 in debt to one-in-four families failing to seek medical attention because of financial worries. Now, another survey — this time from the Consumer Financial Protection Bureau — found that more than 40% of adults struggle to make ends meet. The National Financial Well-Being Survey [PDF] — the first of its kind from the CFPB — aimed to provide a bit of insight into the financial well-being of Americans, and how that can be affected by demographic, employment, and other characteristics. The survey, which was conducted in 2016, asked respondents 10 questions, on which they were then given a score from 0 to 100. In all, the average consumer score was 54. 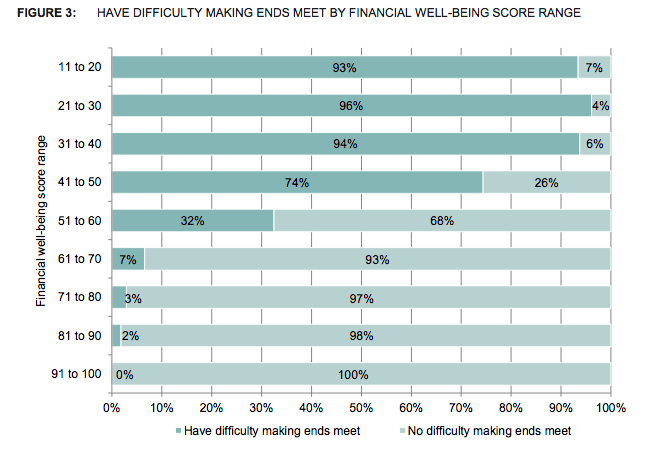 About a third of all adults in the U.S. have financial well-being scores of 50 or below, meaning they struggle to make ends meet or experience material hardships. Another third of respondents have scores of 61 or above, which means they have a low probability of having trouble paying for basic needs. According to the CFPB, at the average U.S. financial well-being score of 54, roughly one-third of individuals has difficulty making ends meet. Approximately one-in-five consumers sometimes have difficulty paying for basic needs like food, housing, and medical care. However, the majority of people at the average score don’t face these challenges. According to the CFPB survey, scores of 50 or below are associated with both a high probability of struggling to make ends meet and of experiencing material hardship. Of the nationally representative sample of consumers surveyed, 43% of consumers report struggling to pay bills. Another 34% of all consumers surveyed reported experiencing material hardships in the past year, such as running out of food, not being able to afford a place to live, or lacking money to seek medical treatment. The CFPB’s report found that an individual’s level of financial well-being was often influenced by their education level, age, income, and employment status. For instance, the survey found the greatest disparities in financial well-being when viewing individual’s savings. Adults with less than $250 in savings had an average score of 41, while those with $75,000 or more invasions had higher score of 68, on average. Likewise, age played a factor in these differences. Those aged 65 an older had an average score of 61, while those ages 34 and younger often had an average score of 51. While the 10-point difference isn’t much, the range can mean the jump between paying your bills and not being able to do so. The study found that while each of these characteristics taken individually don’t make a huge difference in consumers’ financial well-being, taken together, they do. The study found that people with a higher level of financial know-how, confidence, and certain day-to-day money management skills have a more positive relationship with financial well-being. In an effort to ensure more consumers are gaining this knowledge, the CFPB today released an interactive financial well-being tool that will allow people to evaluate their own status and explore how to take control of their finances. The tool allows individuals to use the financial well-being scale themselves, and see their resulting financial well-being score online. People can track their financial well-being score over time, or see how they compare to other consumers nationally, including by income, age, and employment status. Additionally, consumers can access CFPB resources to help take control of their finances and make progress towards financial goals, and find free or low-cost help from financial professionals.